Sony has unveiled its attempt at a 3D computer with its latest Vaio F Series, a beefy laptop with a 16in stereoscopic screen. 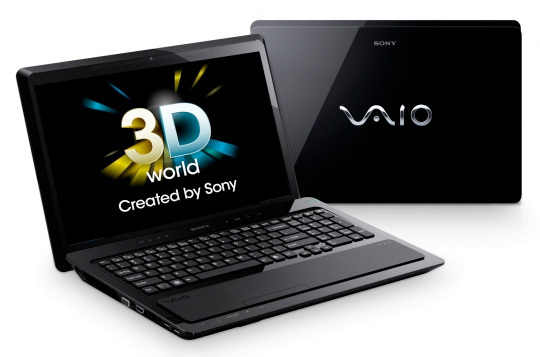 Announced at CES 2011, the Vaio VPCF21Z1E/BI is a heavy piece of kit, but packs a punch, including a quad-core second-gen Intel Core i7 processor, a 640GB HD, 1GB dedicated graphics card and the aforementioned 3D capabilities. You will need specs to view the effect though, and the F Series comes with the same Joe 90s as the Sony Bravia 3D range. Unlike the Asus G51J, there's no need for a dongle, as the 3D sync transmitter is built-in to the top of the display. A push of a button will switch the 3D effect on and off and not only displays full 3D content, but converts 2D footage too, apparently. Content is viewed on its 1080p LED-backlit 16in display with a 240fps frame rate. It has a built in blu-ray drive, HD webcam and two USB 3.0 ports.